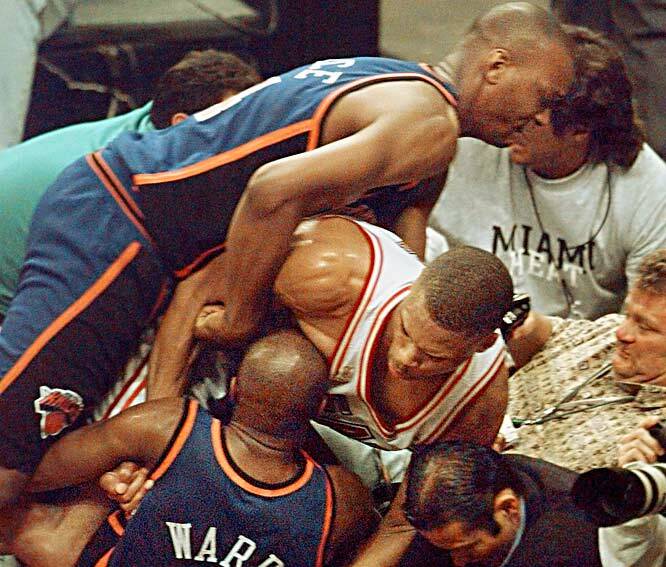 In the first round of the 1998 Eastern Conference Playoffs, the Knicks and Heat were once again paired up for an epic battle. One year after the P.J. Brown incident, the rivalry was still in full bloom. With the Heat up 2-1 in the series, the Knicks won Game Four at the Garden to force Game Five. 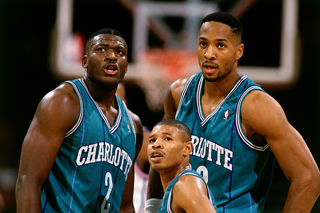 But just seconds before the end of Game Four, the game got physical when Heat Center Alonzo Mourning and Knicks’ forward Larry Johnson started to throw punches at each other (ironically they were teammates in Charlotte just a few years before the incident). The reason this fight is ranked as the #1 fight in Knicks’ postseason history is because of the involvement of Knicks head coach Jeff Van Gundy. Seconds after the fight commenced, Van Gundy sprinted onto the court and tried to hold back Mourning from fighting his starting forward. Given Van Gundy was nearly two feet shorter than Mourning, the only way Van Gundy could stop the fight was to hold onto Mourning’s leg. The fight ended seconds after Van Gundy got in the middle of it, but the damage had already been done. Mourning and Johnson were suspended for the final game of the series. In Game Five, the Knicks would go on to take advantage of the Mourning-less Heat and win 98-81 at Miami. P.J. Brown will never be respected in New York. Whenever you flip over a Knick in an intense playoff game, you will always be hated. In the second round of the 1997 playoffs, the Knicks took a 3-1 series lead on the Heat. In the final seconds of Game 5, the game started to get physical (Charles Oakley and Alonzo Mourning started to get into it). Finally, during a Miami free throw, PJ Brown proceeded pick up Charlie Ward and body slam him in front of the crowd. This started a full team brawl right underneath the basket. Knicks’ stars Allan Houston, Patrick Ewing, John Starks, and Larry Johnson were involved in the fight and received one game suspensions. The NBA allowed the Knicks to spread the suspensions over the course of the next two playoffs games. With a depleted roster, the Knicks would go on to lose the next two games and the series. Some have speculated that Pat Riley told PJ Brown before the game to get into a fight in order to get some Knicks players suspended. Fortunately, the Heat would go on to lose in the next round to the Bulls in five games. The Knicks are back baby!! 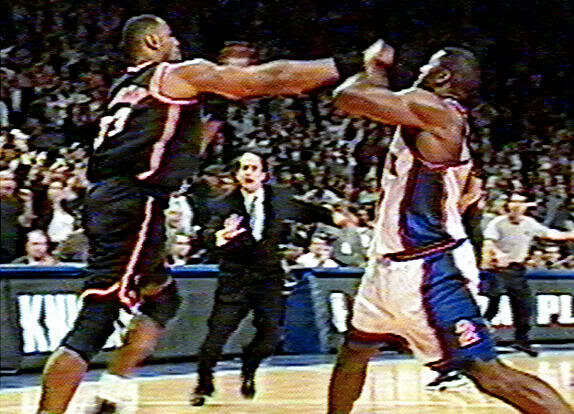 In honor of the Knicks in the postseason, we will have a countdown of the top 5 Knicks playoff brawls…starting NOW!